This past weekend Mr Walsh Cooks took a trip to Calgary to visit his Mum. I thought to myself that this would be a terrific opportunity for me to give up technology for a few days. You see, I had been thinking of going away on a retreat. I had several ideas in mind. One was to join a religious community in Toronto for the weekend for peace, quiet and spiritual reflection. However, the cost for the flights was prohibitive, so that got axed. Then I thought I could seek peace, quiet and spiritual reflection at the Jasper Park Lodge, but I had fears of my still attached winter tires leaving a black tread from Edmonton to Hinton and driving the rest of the way to Jasper on my rims thus ruining my car for our upcoming winter, making that trip also cost prohibitive. Then the idea of staying at a local B & B entered the mix, but to make that into something special I would want to stay in one of Edmonton’s more scenic neighbourhoods, and it just so happens I live in one of them and all the others are adjacent or nearby. So, here I am living in one of Edmonton’s best neighbourhoods and thought, well, with Michael away, I can turn my weekend here at home into one of peace, quiet and spiritual reflection. And to do this, I felt I could not access the phone, the internet, text messages, e-mail, and anything to do with the TV, including Pay Per View, Netflix, You Tube, iTunes and all other goodies that feed through Apple TV and Shaw. I even had it in mind to unplug the clock radios in our bedroom to completely de-synchronize me from the rest of the world (besides, Google says that clock radios ruin Feng Shui in bedrooms). On Friday, with the determination of any Monday morning dieter, I went to work excited that I would come home to peace and quiet, no e-mail of cat gifs to watch, no phone calls to return, no blog to write. Most of the morning I held on to the vision that I would come home, sit on my comfy chair, take a few deep breathes and would enter a Zen state that would last the weekend, with me walking through the apartment in a serene state, sipping green tea, stopping to meditate for a a few hours, then get up to have a simple supper of broth and fresh bread, followed by another meditation, and repeating this all weekend long. Well, it all started to crack about Friday mid-afternoon when I was already looking for distractions like a beer after work. 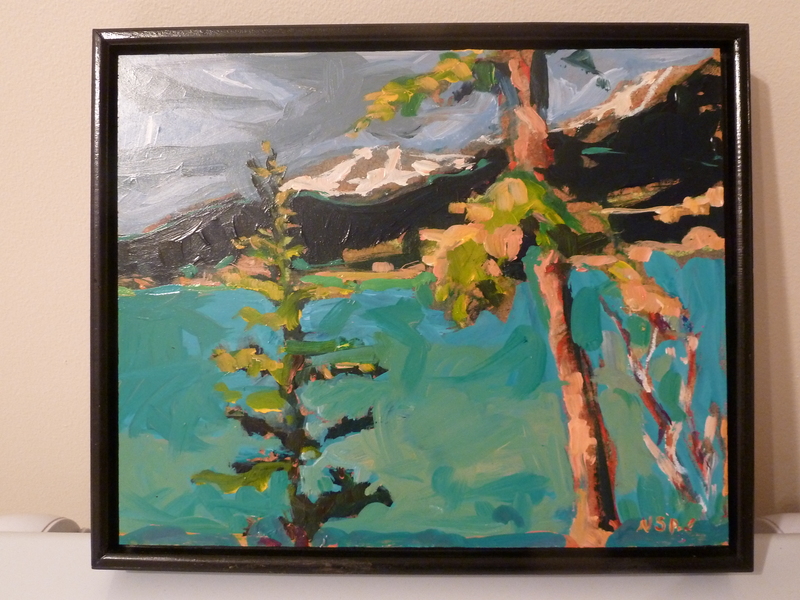 When that didn’t work out, I remembered I had an Art show to attend to and pick up a painting I bought a few weeks ago. Art purchased a few weeks ago. I ended up buying a few more. Suddenly the cost of the return flight to Toronto, having the winter tires changed to my summers (in mid August) AND booking a weekend at the Jasper Park Lodge seemed reasonably priced. I exaggerate, but I only say I exaggerate because Michael will be reading this. But seriously, I exaggerate. Slightly. *pausing to allow the guilt to have it’s moment then I’ll let that go*. I blame the wine. There is a reason they serve free wine at those art shows, and I fall for it. Every. Single. Time. I might be hated by the internet for saying so, but if World Vision had free Friday after work wine and cheese events, I would probably sponsor small villages of children. Just being honest. Saturday morning started easy. Woke up. Got ready for the day, headed to Fringe. 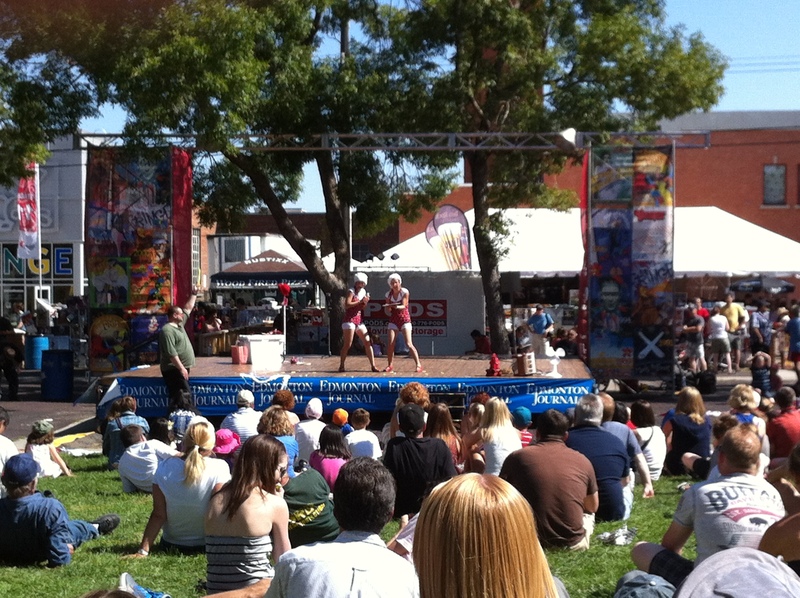 Met friends for lunch on Whyte Avenue, then went and watched the adorable Kif-Kif Sisters on the outdoor stage. Couldn’t resist, and my second technology cleanse crack was pulling out the iPhone to take a picture of these two twins and the man they pulled from the audience to hold a cucumber over his head for about 10 minutes. Note man holding cucumber over his head. He was demanded more than once to “hold it higher”. Turns out, that is all he had to do! Michael and I vowed we would only call each other when he arrived in Calgary to appease my worrying mind that he got there safe and sound, and then again when he left to come home. This was difficult because whenever we travel apart from one another we spend hours on the phone with each other doing the usual lovey-dovey oochie cootchie miss you no I miss you more routines. On Saturday evening when I was bursting to share the day’s event with my beloved, I had to instead distract myself with something else. But when you are on a technology cleanse, what else is there? I cleaned the kitchen sink. That took one minute, maybe two minutes because Comet just doesn’t rinse easily. Then I thought, I really need to tell Michael about the mime. But I resisted the temptation to phone. So I thought I should get spiritual, and to get spiritual I thought I should have a glass of wine. And well, that led to a bottle of wine followed by a lovely afternoon nap on the sofa. When I woke, the TV was on before I knew what was happening. Then I had a wee peek to see if it was my turn in Scrabble, and who might have e-mailed, texted, FB messaged me. I felt smug when I saw it was my turn to play Scrabble, and that I had e-mail and texts to return. The smugness continued when I turned it all off and DIDN’T respond to anyone. I felt liberated! Joyful! Look at me world! I can ignore you! But I twitched. Oh I twitched. So ended up spending a good hour watching You Tube videos, followed by an evening in front of the TV lapping up every second of previously PVR’d episodes of Judge Judy, Big Brother and Coronation Street. I wake up Sunday morning, and while waiting for the kettle to boil for my coffee, I was playing Scrabble, reading and commenting on Facebook friend’s time lines and photographs. The TV was on in the background, I responded to text messages. I resumed Tweeting. So desperate for social networking interaction, I would comment on anything. Anything at all. It’s your birthday and you live in Maine? Well, Happy Birthday to you! John Cleese announces he is getting married? I’m on Google discovering the man got married two weeks ago. It was a revealing weekend. Social networking has become a huge part of my life. I can’t tell you why exactly, but the urge to show and tell, the urge to see how a Facebook friend’s kitchen and bathroom renovations are progressing, how several Facebook friend’s Fringe shows are doing, to click “like” and show my support of a friend’s dissertation, someone’s escape from the city to play golf, a picture of someone’s cat or jam making experience is completely irresistible to me. My community of electronic and real friends mean a lot to me. When a new picture is posted of a Scrabble friend’s child, who’s life I have watched develop and grow over the past two years on Facebook, how can you not click “like”? When a Facebook friend takes a daring political stand about freedom of speech and stands behind posting uncensored opinion on Facebook, although it gives me the willies, I silently, quietly, fearfully, support her determination. I discovered this this past weekend. Technology is here to stay. Try as you might to resist or ignore, it will happen. With our without you. I have decided to be a part of it. And am proud of it. Next time I want to escape though, I will take that trip to Toronto, but even then, I’m sure the Sisterhood of St. John the Divine have free wi-fi for their overnight guests. You should have just gone to Jasper 🙂 I don’t even pretend I can live without social networking anymore! John Cleese got married? That old bugger. Good luck to them in their newly wedded bliss!